A Lottocracy: Somebody’s gotta represent. Might as well be you. A government represented by citizens selected at random – no elections, no campaign fundraising, no corruption. Sounds both intriguing and dubious. But that is what Alexander Guerrero, a philosophy and medical ethics professor at the University of Pennsylvania believes could happen, if a government was based off a lottery system instead of an electoral democracy. “There are lots of problems in a place like the U.S., where to whether we really have the right kind of elections in place to get real accountability. There is significant financial barriers to running for office. So we are going to have a limited set of candidates who are even viable. There is incumbency advantages of various kinds, there is systemic difficulties for third party candidates, there is intentional bipartisan competition reducing gerrymandering, ” says Guerrero on the electoral mechanism in our government. With a “lottocracy” the officials would be picked from a lottery, curbing lobbying between politicians and powerful corporations, slandering of candidates, limiting choice of party selection and high dollar campaigning. After acknowledging the pitfalls of our current democracy, he illustrated how this new system would subtract Congress from the picture in order to reach successful reformation. The event took place on Feb. 25 at U of L’s Ekstrom Library in the Chao Auditorium. 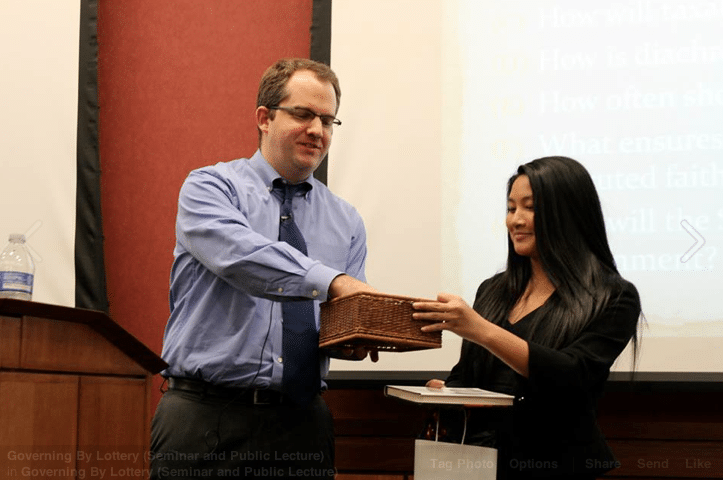 It was the sixth event thus far in the McConnell Center’s lecture series titled “Debating America.” As Guerrero spoke some people chuckled at some of the propositions, while others took notes with increasing curiosity. It is an appealing idea in an era when corruption is rampant in politics and the people feel irrelevant. Though there are still multiple factors that threaten the potential of governing through lottery. Audiences members addressed problems such as the possible selection of convicted felons or drug abusers or the mentally ill and how that would be handled. Another important issue brought up involved the credibility of the experts that would inform the selected officials on legislative topics. The idea of an “expert” is often subjective, and even an expert may still be partial toward certain sociological aspects, gender or ethnicity. Guerrero explained that there are many problems with a lottery system but insisted these problems would not be as pronounced as in our current system. This is because the moral standards in a “lottocracy” would be held higher due to less opportunity for corruption. Random selection means after each term there would be little incentive to bribe officials, if any. Aside from the technicalities and issues, the concept of a lottocratic government is something that is interesting to debate and worthy of being considered. “This is a talk that the McConnell Center does as sort of an outreach to the community, of course the campus community is a part of that but we also encourage people in Louisville and invite teachers and students to come and hear the lectures to discuss ideas and various topics of the day,” added Public Relations Coordinator and Doctoral Candidate GlyptusAnn Jones of the University of Louisville. The next lecture series event will take place on Mar. 23 from 6-7 p.m. and will also be held in the Chao Auditorium. It will discuss America’s prosperity in a predicted world of disorder in the 21st century. Author and Geopolitical Strategist Peter Zeihan will be the speaker. analyzing these kinds oof things, therefore I amm going tо inform her.